Last year saw the release of Battling Boy by Paul Pope, his longest comics work in years. Perhaps unsurprisingly to many, it was a great read and one of my favourite comics of 2013. The Rise of Aurora West is co-written by J.T. Petty and Paul Pope and it is illustrated by David Rubin. I can’t help but to compare this comic to Pope’s Battling Boy. 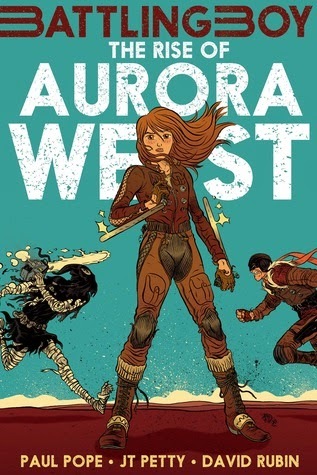 I apologize for that but only briefly because the comparison has helped me realize just how much The Rise of Aurora West effectively stands on its own, despite the obvious ties to Battling Boy. This comic is a prequel to Battling Boy. It’s set in the same universe (an alternate Earth) as that story and most of the story takes place in the city of Arcopolis, a huge city that has a problem with monsters. Science hero Haggard West, a combination between Doc Savage, Indiana Jones and Batman, has made it his personal mission to fight the monsters that wreak havoc in the city and spend their nights kidnapping children. Though he plays a big role in the comic, the focus is pretty clearly put on his daughter, Aurora West. She is training in the art of monster slaying under her father. Many comparisons can be made between the relationship Aurora has with her father and the one Battling Boy has with his father but I do not want to spoil anything by saying too much. I will say that Haggard, for all his faults, seems to be doing a better job of instilling values in Aurora and raising her to be a resourceful young woman. He is teaching his daughter how to be independent and work her way through any situation that could arise. He puts a lot of value into preparation. The thematic developments and character growths of Aurora West and Battling Boy are a delight in contrasts and similarities. While Battling Boy lacked some of the more mature elements of Paul Pope’s previous comics, it wasn’t exclusively for children and young teens. It was a very good example of the wide appeal that great all-ages comics can have. At first I wasn’t sure I would be able to say the same for The Rise of Aurora West. I’m not sure how I developed this opinion but by the time I finished reading, it was clear to me that it’s a great companion piece to Battling Boy even though it has a different tone. Young readers will certainly enjoy all of the monster hunting action while adult readers will appreciate Aurora’s growth as a character. It’s a book that offers quite a lot to enjoy and it’s clearly the work of skilled creators. Similarly to how I can’t help but compare the story of both works, I can’t avoid comparing the art by David Rubin to the art of Paul Pope. Much like the comic as a whole, Rubin’s art differentiated itself from Pope’s art and the final result is a style that is occasionally similar to Pope’s but ultimately something unique to Rubin. I wasn’t sure if Rubin was trying to ape Pope’s style and after looking at sample artwork on Tumbler and on Rubin’s blog, I came to the conclusion that he’s not intentionally trying to mimic Pope for Aurora West but Pope is clearly one of many influences on Rubin’s overall style. I also see the influence of Rafael Grampa, particularly in Haggard’s large chin and in some of the smaller details on clothing and hair. Funny enough, that’s also where I see a lot of Pope’s influence, in the clothing and the hair. A lot of the technology feel informed by Pope’s renderings in Battling Boy and that just makes sense considering the close ties this comic has to it. The facial expressions and the monster designs are entirely Rubin’s. Initially, I felt bad that there was an artist who had to follow Pope’s act. Pope isn’t just a master illustrator, he’s also an excellent storyteller. He has what I would describe as a difficult style. You need to learn how to read it before you can truly appreciate it. He gives the illusion of an artist who is rushed and decided to publish sketches instead of finished art but under that high-energy line work is a mountain of details to be absorbed and cherished by the studious reader. He also uses a lot of heavy inking and in the hands of a lesser artist that could easily be disastrous and result in unreadable and muddy pages. Pope manages to make it all work without putting the storytelling elements out of focus. Pope’s art can seem unpolished and unaesthetic to readers who are unfamiliar with his work but I’ve come to really admire and enjoy it. Rubin is a different kind of artist. He’s much more expressive than Pope and that works to his advantage in The Rise of Aurora West. He does try to capture the looseness and the frenetic feel of Pope’s art but he doesn’t always succeed. His line work is softer and rounder than Popes and there appears to be the influence of cartoonist, not just skilled illustrators. There are several examples of very good cartooning in this comic. I won’t be adding Rubin’s name to my list of favourite comics artist just yet but he shows promise and I’m looking forward to seeing more work by him. It’s commendable that Rubin took on the challenge of illustrating Aurora West and I hope that he receives the recognition for his efforts on this book. I also hope that his future projects are packaged in a larger format as the 5 x 7 ½ pages weren’t big enough to allow me to fully appreciate his artwork. The writing was also quite good. 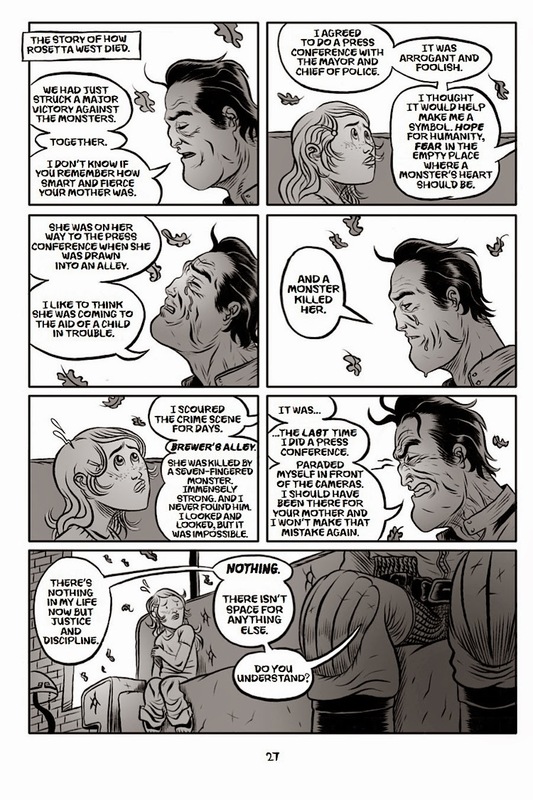 Petty used more dialogue than I’m used to seeing in a comic by Pope but I think that worked to his advantage. One of my criticisms for Battling Boy is that it felt light. There wasn’t as much story going on in those 200 pages than what I wanted. Pope usually writes comics that are dense, both in story and in art. The small format of Battling Boy and the quick story made for a lighter than usual read. Contrary to that, The Rise of Aurora West packs significantly more story in its 160 pages than its predecessor did. The dialogue isn’t superfluous though. Petty uses this comic to tell the story of Aurora. That might seem like a strange thing to say but it’s not uncommon for the boy hero to overshadow his female counterpart. I was quite happy to discover that most all the other elements of Battling Boy’s story were found in this comic with the exception of Battling Boy himself and any other gods. This statement might make me sound like a cynical comic book reader but female character often get the short end of the stick and I’m just happy to say it’s not the case with this comic. As a prequel, it’s very effective because the focus is truly on Aurora West. She learns about her mother and her father’s past. But we also learn a lot about Aurora herself and the life she had growing up as the daughter of the hero of Arcopolis. We also learn about her connection to Sadisto and his gang. I would not have been surprised to discover that Pope and Petty used this comic to further develop the world introduced in Battling Boy and that’s exactly what they did but they did it through characters and that made it feel more organic. There are a lot of things we do not know about this world. Where did the monsters come from? Why are they attacking Arcopolis? What are they doing with all of the children they’re kidnapping? We do not get comprehensive answers to any of these questions but we do get a better understanding of Aurora and Haggard’s relationship to both the monsters and the city. After finishing the first volume of Aurora West’s solo adventure, I realised that the comic developed its own identity, separate from Battling Boy. It’s a big compliment but the density of the story, compared to Battling Boy, made it feel substantial and that was rewarding to me as a reader. 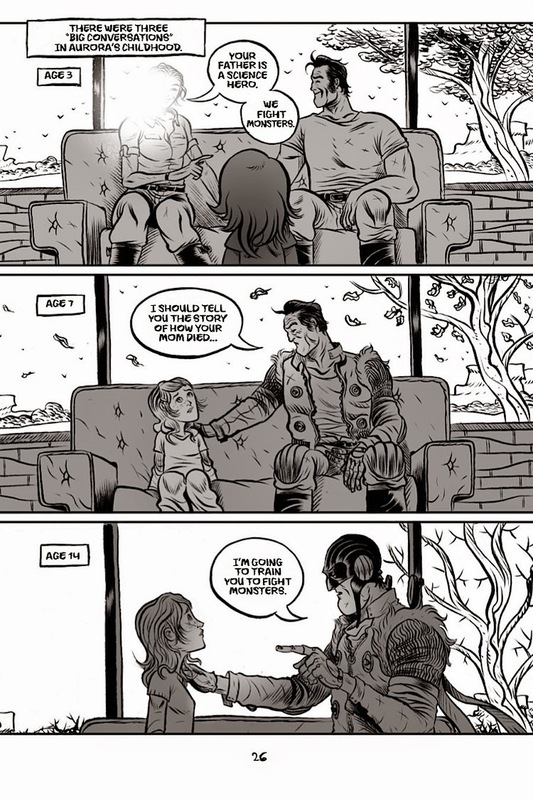 The character development, for Aurora and Haggard also contributes to making this comic feel like an important addition to the story begun in Battling Boy. It’s not just a cash grab comic. You also can’t argue with the cover price, $11.50 (Canadian) isn’t a bad price for 160 pages of comics. Pope has said that he has plans to continue to expand the Battling Boy series. It’s unclear if he has any specific plans beyond the sequel to Aurora’s first solo story or the sequel to Battling Boy but if he does, it looks to me like First Second has a hit series on their hands. I’m already looking forward to Battling Boy: The Fall of the House of West. My advance review copy was provided by Tor.com. The Rise of Aurora West will be released on September 30, 2014.